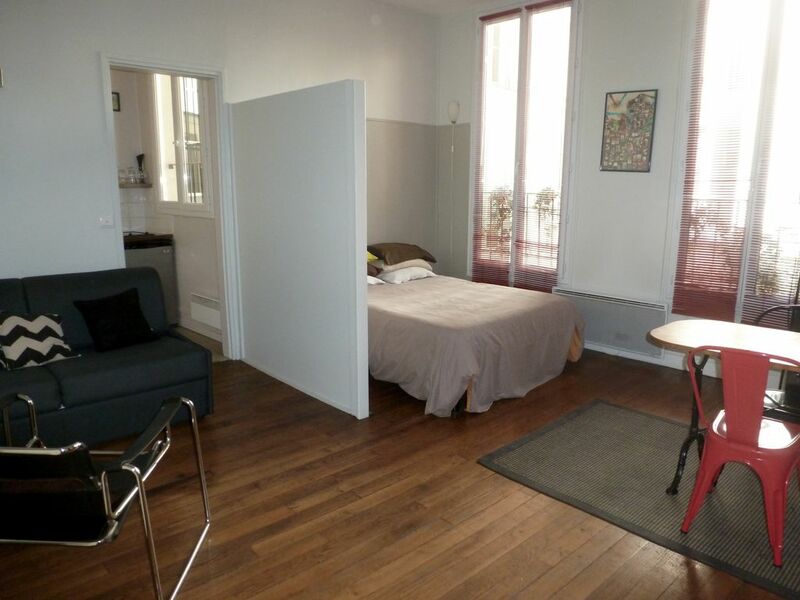 Large Studio in 'Le Marais' - Close to Everything! Location, location! Paris at door steps! This apartment, is much more spacious than the average studio in Paris: 400 square foot. A whole family up to four guests wouldn't feel tight. Unlike some other areas in Paris, you won't have to run more than few meters to buy your groceries or find interesting shops and a wide range of restaurants. 3 metro stations and 5 metro lines close 5 minutes from front door. The apartment is located on the first floor (one floor up from street level). 3 large windows on a courtyard , no street noise! In the separate kitchen: everything you need including a washer/drying for your clothes. The studio is fitted with a queen size bed in a alcove and a convertible sofa. All linens and towels are supplied also an ironboard and a hairdryer. WiFi Internet access and free telephone calls. Le Marais and those ancient houses and palates, lively caffes, restaurants and abundant shops of all kind has always been my favorite promenade. Paris is at door step. The studio is ideally located to metros, patisseries, grocery stores, shopping, bistros, and a nice park with a playground nearby (we traveled with our six-year old daughter and it was nice to be able to sit and lay her play with other kids). It was also a walkable distance to Notre Dame, St. Chapplle, and the surrounding areas. It is a very quiet street and building. The bed is not very comfortable, but everything else was great. There is only a small refrigerator, no freezer, and a cooktop (no oven), so you need to choose your cooking and food options with that in mind. We would definitely stay again on a return trip to Paris. Merci beaucoup Shaine for this elaborate comment. I hope to host your beautiful family again; the soonest the better! Claude was very responsive . The flat was clean and convenient, and the host was friendly and helpful. The flat is convenient to everything you could want--groceries, bakery, restaurants, and the Metro. It's in an interesting and kind of quirky neighborhood--be sure to visit the Museum des Arts et Metiers which is practically next door, and full of fascinating things. We stayed in this studio for almost a week and found it to work well for our needs. Claude was accommodating and helpful. The space is very small by American standards, especially for a family of four, but certainly larger than you would find many places in Europe, especially for the price! We were there during a heat wave. Thankfully, there is a small air conditioner, but we had to keep the blinds closed during the day to keep the space from being too hot to sleep at night. We liked the location, with quick access to the Arts et Metiers and the Strasbourg-St. Denis stations. Also close by: a grocery store, post office, and wonderful boulangerie. Claude responded quickly and professionally to a disturbance issue outside the apartment. A tidy apartment in a back alley that's near many touristy restaurants. A short walk from most amenities and several metro stations. Not the most picturesque area. Suitable as a centralized spot from which to go visit areas of Paris, but not itself a place you'll want to be hanging out very much as there is nothing to speak of in the immediate area. Walking distance to the Seine and Notre Dame as well as some nice neighborhoods. Thanks Dene for taking time to resume your stay. Sorry you where not pleased by the look of the street and the building. It's a typical street of old Paris (The building where the studio is located is from the 18th century) as all those houses in the "Marais", side to spectacular and splendid palates and yet inhabited in ancient time by poor workers: Not picturesques at first degree but this makes the charm of this antique historical Marais!